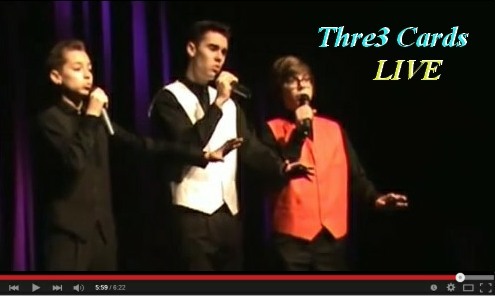 Thre3 Cards Vegas’s Viable Vocal Trio! 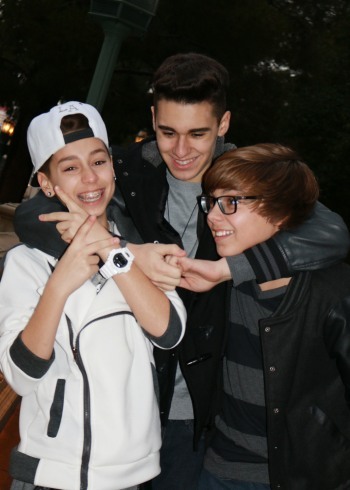 When we first introduced Santino, Gianni and Dante Cardinale they went by the name of C-Boyz Starz. Since their first introduction on this site the boys have perfected their act and have made numerous appearances back in Vegas and other notable venues. These ‘Brothers for Life’ have loved music and have been signing together since early childhood. The boys told me that they changed the name of their group from C-Boyz Starz because they wanted a new, more mature name for their trio. “Thre3 Cards”. The THREE CARDinale brothers have individual aliases as well, Santino the “Joker,” Gianni the “King of Hearts,” and Dante the “Ace of Diamonds”. The Thre3 Cards have dedicated their lives to music, and singing in front of a live audience is their specialty. They come alive on stage and the audiences of all ages seem to follow suit. They have the most amazing and loyal fans that call themselves the CARDiacs! Whether they are singing an original song like, “When Its Real,” or singing one of their covers like, “All of Me,” by John Legend or an a Capella version of “Yesterday” by the world famous Beatles, their three-part harmonies and solo vocals excite audiences of every age. All of their performances and appearances are listed on their website. Some of the regular performances are the San Gennaro Feast, First Friday in Downtown Las Vegas, and at the Italian American Club. 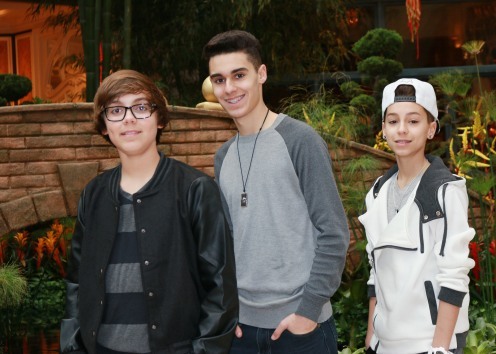 Recently they have performed at the Sam’s Town Casino and sang along with the LIVE band for the first time. Their website also has an amazing web store for 3C merchandise and song downloads. It is a must see! As part of the Thre3 Cards compassion for others, they joined with the organization, “Tunes for Tots”, where kids throughout the world donate their talent by performing to raise money for various charities. Santino, Gianni and Dante feel very blessed in their lives and love the idea that they can give back in some small way with their talent. The message the boys would like to impact to their peers and all listeners is to always follow your dreams no matter how big or small. They believe with hard work and dedication, dreams can come true. NEVER GIVE UP. The Thre3 Cards have been fortunate to have the opportunity to work with such production companies as “Just Look Up Music,” and “Prod by Incod.” The boys have several original and cover songs they are in the process of recording. They also have an upcoming audition for Americas Got Talent so wish them luck! The boys have many social media sites and also can be found on Vine, Spotify and Shots. The others are listed below where you can subscribe, follow, and support them in their musical adventure. Congrats to Santino, Gianni, and Dante on all their recent success and we wish you even greater success in the coming years.